And so, we come to the second last part of our TPL100 countdown. We've had some laughs, we've shared some frights, it's been emotional, and I think we all learnt a little something about each other - and ourselves. 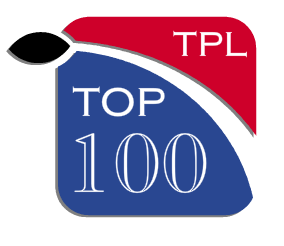 Yes, it's almost - almost - time for us to put the TPL100 to bed until next year; but first, there's that small matter of revealing our top twenty players for 2012. Kicking off our top twenty is not only the top safety on our list, but arguably the top safety of this millennium. In the ten years since he entered the league, Reed has led the NFL three times in interceptions, been named to eight All-Pro and Pro Bowl teams (only missing out in his rookie season and an injury-shortened 2005 campaign), won the 2004 Defensive Player of the Year award, and been named to the NFL All-Decade first team for the 2000's. But this list is not rewarding past achievements; so what makes Ed Reed still our no. 1 safety for the 2012 season? The fact is that, even though at the age of 33 Reed is less durable than he once was (his 16 starts last season was the first time he started every game since 2008), his instincts for the game are still unbelievably sharp; he still has the speed to keep up with the top receivers in the league; he is still as sound and solid a tackler as you might hope to find in a secondary; and he is still a consummate professional in his approach to the game. Forget his age – Reed's phenomenal skillset is as sharp and present as they ever have been, and for so long as Ed Reed still pads up on Sundays, he will remain the top safety in the NFL. The 2012 offseason has been one of the most eventful ever, but there is one interesting trend that hasn't received that much attention among the media: there are teams whose entire offense only works because of their top flight running backs, without whom, those teams may as well give up all hopes of making the post season – and several of those teams have, this offseason, found themselves in contract disputes with those running backs. The Bears, the Ravens, the Jaguars – all of them are currently going through their offseason programs without their stud RBs, unable to come to a resolution. The Eagles, however, can breathe – together with the Bills, they are the only two teams who have to have their running backs under contract to win games, who have managed to resolve their contract disputes with their ball carriers. Why is LeSean McCoy so important to the Philadelphia offense that they gave him a five year, $45 million extension? The stats do offer an explanation – McCoy is coming off a season where he led the league in rushing touchdowns at 17 and topped 1300 rushing yards, and since taking over the starting role as a sophomore in 2010, he has averaged 5 yards a carry, while his average 63 receptions a season as a starter speaks to how much of a weapon he is in the passing game. Simply put, “Shady” McCoy is the type of running back that can succeed in every aspect of the position, in any situation, on any down. Coupled with the fact that Michael Vick is always a liability to get himself hurt and miss gametime, and you can see why the Eagles knew they had to get McCoy back in the fold, no matter what; they can't win without him. When teams are ahead on the scoreboard, they will most often try to preserve the lead by controlling the clock and maintaining possession, which normally translates into a heavy reliance on the run game. The Vikings in 2011 were, frankly, terrible. Their back seven on defense was a mess, while they only had two viable weapons on the other side of the ball – all teams had to do was subdue Percy Harvin and load the box up against AP, and the game was pretty much won. Placed in that situation, it'd be understandable for even the best defensive linemen to have a 'down' year, rarely being able to place teams in routine third-and-longs that generate large sack numbers. It is therefore very hard to understand how, put in that situation, our top-rated 4-3 defensive lineman was able to rack up a league-leading, very-nearly-record-breaking 22 sacks. Just think about that – with opponents almost never needing to throw the ball heavily in order to claw back leads, Allen was still able to rack up a monstrous 22 sacks, adding a combined 63 solo & assisted tackles in the run game. The man is ridiculously durable – the only 4-3 DE, according to ProFootballFocus, to see over 1000 snaps, and he took over the long-snapping job when the regular LS was injured. Allen is a force of nature, putting his body through more action than anyone else at the position with almost no help from the other ten guys on the field, no support from the offense to lighten his load, and is still able to produce at the absolute highest level; and for that, Allen is unquestionably one of the best defensive linemen in the league. In case the name of the blog didn't give it away, we at The Pulling Linemen are or were linemen, so it's no real surprise that we love linemen – and no offensive lineman got more love than Jason Peters. In fact, it's about damn time Peters got some love: of the top five offensive tackles on our Top 100, the other four were all taken in the first round of their respective drafts; Peters wasn't even drafted. Working out pre-draft as both an offensive lineman and as a tight end, the position he played through most of college, Peters eventually caught on with the Bills through the practice squad, initially as a special teamer and blocking TE. In his third season, he became the starting right tackle for Buffalo, replacing spectacular bust Mike Williams; the next season, he made his first Pro Bowl and was named to the All-Pro second team. Since then, Peters has been one of the top tackles in football, making a total of 5 Pro Bowls and 4 All-Pros in recognition of his simply outstanding play. With his background as a tight end, Peters has the agility to match even the most elite pass rushers step for step, while using his aggression to be an absolute force in the run game. Tearing his Achilles' in the offseason, Peters will likely miss the 2012 season – but if we can learn anything from his drive and desire to work his way up from a practice squad player to the best offensive lineman in the league in our eyes, there is no question that he will return in 2013 as the most beastly OL the game has to offer. 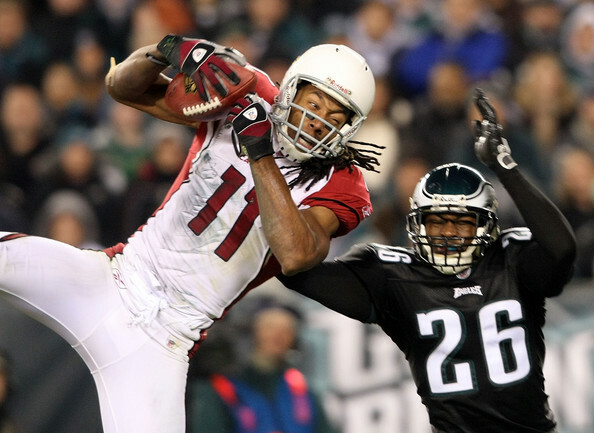 When asking who the best player at a particular position is, there is very rarely consensus; but there are certain names that are always brought up in those type of discussions – and when it comes to receivers, Larry Fitzgerald is undoubtedly one of those names. With the exception of his rookie season, he's had over 1000 receiving yards in every season where he's played in all 16 games (he came up 56 yards short in 2006, when he missed three games), making the Pro Bowl in each of those seasons. After leading the league in receiving touchdowns in back-to-back seasons, Fitz's scoring output dropped dramatically with the absence of Kurt Warner, dropping by over half. But if anything, the two previous two seasons, which saw huge turmoil at the QB position for Arizona, showed just how damn good Larry is. He's had five different quarterbacks throwing him passes the last two years, but Fitzgerald has shined despite having to adapt and re-adapt to different throwing styles as Arizona searches for a long-term answer under center. In both the 2010 and 2011 seasons, Fitzgerald had more receiving yards than during his '09 campaign, when he caught a career-high 13 TD s; his 1411 receiving yards this past year was only 21 yards short of setting a new single-season personal best, while averaging a career-high 17.6 yards per reception. Without any sort of consistency at signal caller, Larry finds himself as our third-best receiver for 2012, but if the Cardinals somehow manage to find themselves a good quarterback, then Fitzgerald may well still have his best years ahead of him. With big bro Peyton sitting out the 2011 season, little Eli finally got a true opportunity to step out from under his sibling's shadow; he responded with arguably the best season of his career, capped off with something his brother doesn't have – a second Super Bowl ring, and a second Pete Rozelle Trophy (a.k.a. the Super Bowl MVP award) to boot. Despite only sneaking into the playoffs with a 9-7 record, Eli had a fantastic season on an individual level, coming just 70ish yards short being only the fifth quarterback to pass for over 5000 yards in a single season (seriously though, how crazy a year was 2011 for QB s? Before last season, there were only two 5000 yard passers). His 4933 yards were over 900 better than his previous best, cutting down his INT total by nine while throwing the second most TD s of his career. Furthermore, at 31, Manning is only now entering his prime, with at least a good 5+ years left before his physical tools only start to diminish. As he enters his ninth season, Eli has a wealth of experience to rely on, two Super Bowls to his name to boost his confidence, and is finally being recognised on his own merits, rather than always being compared to Peyton; factors which, together, should see Eli in great position to take his place among the cream of the NFL. In the section about Jared Allen, I already gushed about how he was able to produce monster numbers despite being in a terrible situation at Minnesota. Well, the flipside is that Peterson really suffers for being in that same situation. With only Percy Harvin offering any type of threat in the receiving game, Adrian Peterson has been facing, and will continue to face, eight or more men in the box every play the past few seasons. That hasn't stopped Peterson, who has never had single-digit rushing touchdowns in a season, and in 2011 missed out on a thousand rushing yards for the first time in his career, thanks to missing four games with a torn ACL (he still finished with 970 yards through 12 games). Peterson is undoubtedly a force as a running back, and while he's perhaps not as complete as the running back who ranked ahead of him, he can play in all phases of the game, as he is a good receiver out the backfield and is decent enough, if nothing special – which is more than most running backs in the league. Still, if you were to rank all running backs purely on what they do as a ball carrier, Peterson is far and away the best in the league, someone who has the power to run through and over people, shifty and agile enough to evade and avoid, whether diving up the gut, running powers between the tackles or bouncing to the outside, there is nothing that Adrian Peterson cannot do once he has the ball in his hands. Being a running back, of course, you have to be at least a little concerned about how long it will take him to bounce back from the ACL, and even though he will likely see most of the 2012 season, he might not return to full strength until the following year; but even so, Peterson is such a special talent that he will no doubt still be dominant this season. Following on from Larry Fitzgerald's entry, Andre Johnson is another name that you cannot leave out when discussing the league's top wideouts. Johnson is a dominant specimen, fast, strong and tall, a leader on his team and with some amazing catches to his resume. For years the only viable receiving option in Houston, Johnson does not just break out of coverage, but routinely smashes through double or even triple coverage with the greatest of ease, twice leading the league in receiving yards and three times in yards-per-game. One thing holds Andre out of the top receiver spot more than anything, though, and that it is that he is often hampered by injuries. He has missed games in four of his nine seasons, with 2011 seeing Johnson unable to take part in a majority of the team's games for the first time in his career. Johnson is also expected to be held out of the offseason program for two months due to injuring his knee, and with him not taking part in all 16 contests in a season since 2009, questions are starting to appear over whether AJ has become chronically injury-prone. Even if this does prove to be the case, Johnson is such a good receiver that even missing games, he is a vital part of the Houston offense, and if the Texans make the playoffs again, you can be assured that Johnson will be a major reason, no matter how many games he plays in. There are, as I've mentioned, some teams whose offense relies heavily, if not entirely, on their stud running backs, and that several of these teams have, this offseason, found themselves embroiled in contract disputes. LeSean McCoy's situation was resolved; at time of writing, Maurice Jones-Drew, is currently holding out of OTAs, feeling that his level of play deserves a higher level of pay. MJD has two years left on his contract, and is scheduled to earn good money - $4.45 million in 2012 alone – but he holds a valuable bargaining chip; unlike McCoy with the Eagles, where they do have some top level receivers and a good QB (when healthy and not in prison), Jones-Drew is the entirety of the Jacksonville offense. 2010 tenth overall pick Blaine Gabbert looked horrendous in the pocket, terrified of defenses and often looking lost and confused, and with no particularly remarkable talent at receiver (maybe Laurent Robinson) – and no-one decent to get the ball to what receivers they do have – if MJD holds out, the results will be disastrous for the Jags. Since taking over as a starter in 2009, “Mojo” has made the Pro Bowl and topping 1300 yards every season, making the All Pro first-team during 2011, when he lead the league in rushing with 1606 yards. MJD is equally important to the passing game, where he not only shows a good propensity for blocking, but as a receiver contributes around 40 receptions a year, averaging 8.9 yards per reception for his career. While he might not be as good a pure runningback as Adrian Peterson – as I said, there is no one who does it better – his value in the passing game as a receiver and as a blocker sees him just pass Peterson on the list, for as good as Peterson is, with the direction the game is going, it will be the Jones-Drews, McCoys – and our top rated running back, who will be revelaed tomorrow – that are becoming the prototype instead of the Adrian Petersons. Put simply, the Jacksonville offense begins and ends with MJD, and if they have any desire to win whatsoever, Jones-Drew should be an even richer man by the time training camp rolls around. We end the penultimate part of our countdown with our highest-ranked outside linebacker, and there should be no surprises whatsoever that it's DeMarcus Ware. Just a half-sack shy of the big 1-0-0, Ware has been one of the true elite pass-rushers of the NFL since he entered the league. Amassing 8.0 sacks as a rookie, it marked the only season of his career that Ware didn't record double-digit sacks. Never missing a game in his career, despite a scary neck injury in 2009 that saw him carted off, Ware has twice led the league in sacks, and his accolades are both numerous and impressive – 6 Pro Bowls, 6 All-Pros, the 2008 NFC defensive player of the year and making the NFL All-Decade second team for the 2000s. Even as he enters his 30s, he shows no sign whatsoever of any dropoff in his play, missing out on his second 20-sack season by only half a sack in 2011, despite having an atrocious secondary behind him. Ware's 2012 season, therefore, promises to be an even greater one for the pass-rusher, as a much improved secondary should mean opposing quarterbacks have to hold onto the ball longer to wait for receivers to come free – meaning they're spending more time at the mercy of DeMarcus Ware. Is Ware an all-round linebacker? Not particularly – while his run defense is solid, if unspectacular, he's never been much of a factor in coverage. Quite frankly, he's never needed to be – the fact that, as something of a one-trick-pony while defending the pass – rush, rush, and rush some more – he is still the 11th best player in the NFL coming into 2012 (according to us), speaks volumes to just how fearsome a threat he is. The best left tackles in the league are often left staring at a big Ware-shaped dust cloud while, behind them, their QB is being slammed into the dirt, courtesy of #94. Ware is to the pass-rush what Adrian Peterson is the running back – they might not be able to everything at a phenomenal level, but in terms of what they are asked to do, they are so far ahead of the rest of the league that there is no-one who can come close. Remember to leave your thoughts in the comments or on facebook, or tweet at us, and we'll respond to the best. Come back tomorrow when we finally reveal what you've all been waiting for - the top ten players in the NFL for 2012, as voted for by The Pulling Linemen.